Boreal forests and Arctic tundras contain peat which stores carbon that is released when it burns. 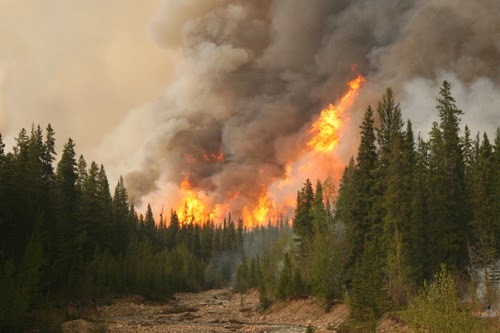 This is one of the worst years ever for wildfires in Canada's boreal forests. Up to two million hectares of boreal forests are expected to burn in the Northwest Territories alone this year. The relationship between heat and wildfires around the Arctic is complex. Some areas like western Siberia are not experiencing the abnormal heat that we see in the Northwest Territories. Scientists, including those at NASA attribute this to the looping waves of the jet stream the facilitate the persistence of ridges of dry air in some locations while moisture-laden troughs linger in others. In boreal forests some species of trees can be entirely eradicated by fire and never return. Permafrost is another casualty of big fires. When permafrost melts away under a fire, it makes it harder for some species of trees to repopulate in the burned out area. One of the most destructive elements of fires involves a dangerous feedback loop. Boreal forests are commonly situated on peatlands which have huge carbon stores that are released when burned. Vast amounts of carbon are locked in boreal forests and the northern tundras. Roughly half of the world's soil contains peat. According to University of Guelph professor Merritt Turetsky, the burning of forests containing peat, "could represent a runaway climate change scenario in which warming is leading to larger and more intense fires, releasing more greenhouse gases and resulting in more warming."